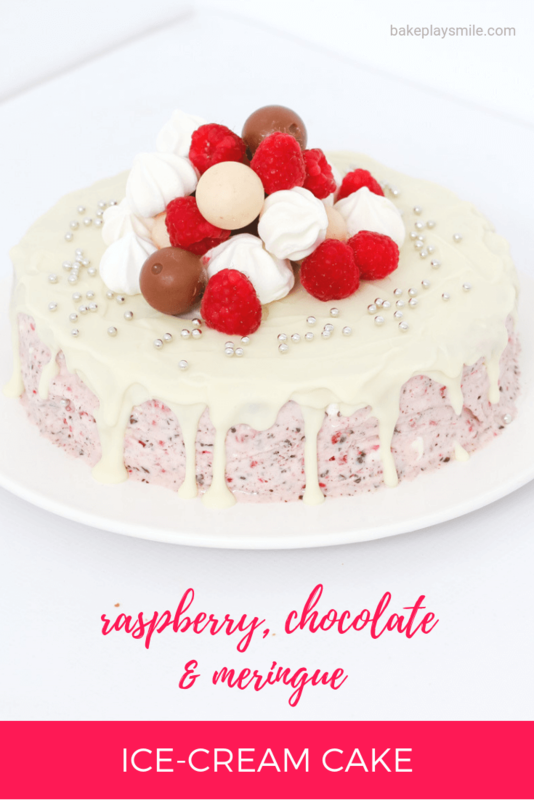 A deliciously simple Raspberry, Chocolate & Meringue Ice-Cream cake that takes less than 10 minutes to prepare… this is the perfect summer dessert! 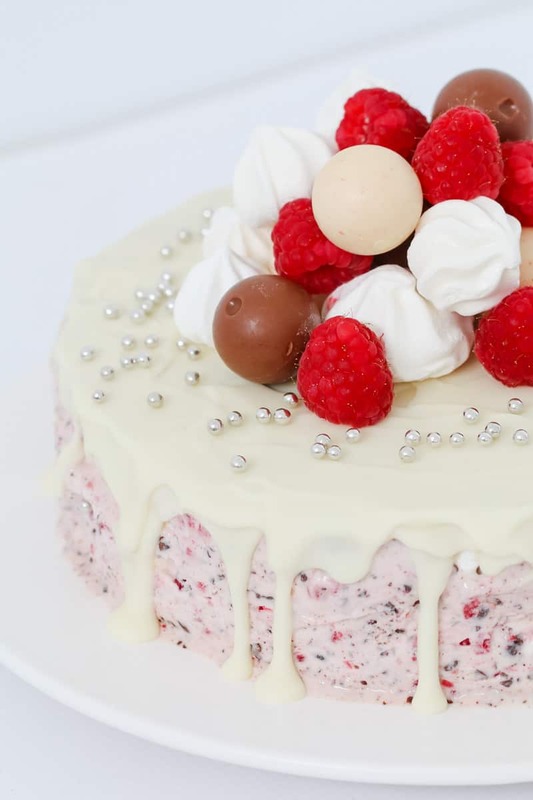 This Raspberry, Chocolate & Meringue Ice-Cream Cake is for you! With less than 10 minutes prep time (plus freezing time), just a few ingredients and hardly any dishes… this is a dessert that not only looks and tastes great, it’s also the easiest thing in the world to make. 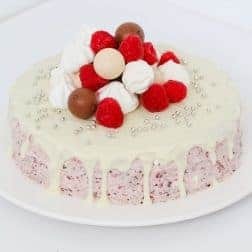 When it comes to summer desserts, you really can’t beat an ice-cream cake (especially when there’s berries and chocolate involved too!). 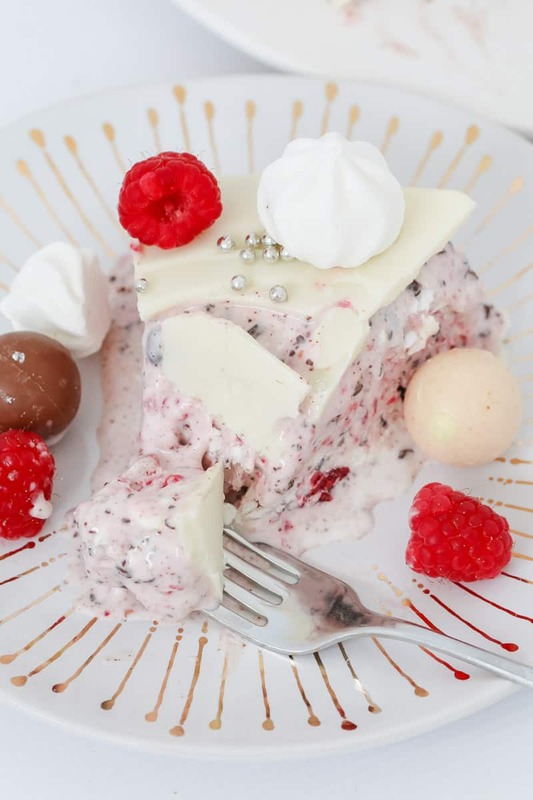 This Raspberry, Chocolate & Meringue Ice-Cream Cake is made from plain vanilla ice-cream and flavoured with raspberries, chocolate and meringue. If you’re looking for a flavour match made in heaven… these 4 ingredients are just that! So whether you’re looking for a simple summer dessert, a Christmas ice-cream cake… or just a cheeky late night bowl of ice-cream, this needs to become your new go-to recipe! And while we’re on the subject of ice-cream cakes, make sure you check out my collection here! 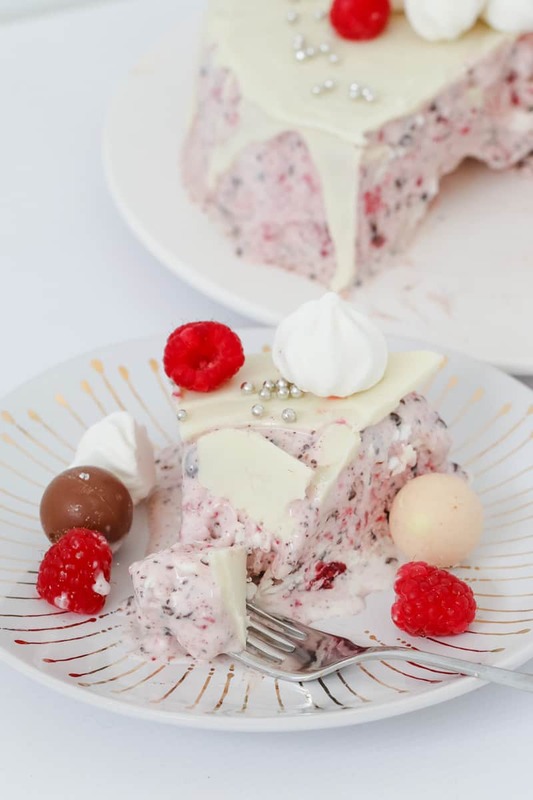 A deliciously simple Raspberry, Chocolate & Meringue Ice-Cream cake that takes less than 10 minutes to prepare... this is the perfect summer dessert! Place the softened ice-cream into a large bowl. 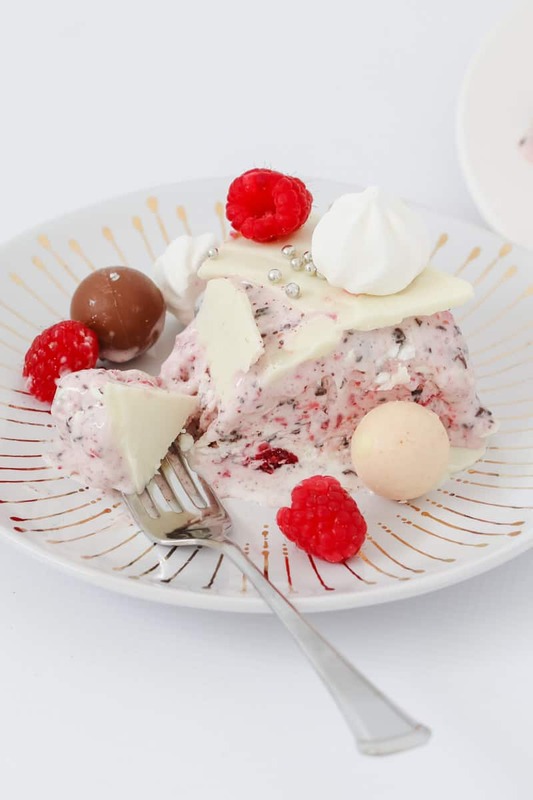 Stir through the frozen raspberries, grated chocolate and mini meringues. Pour the mixture into a round 23cm cake tin (greased very well with butter - or lined with cling wrap). Smooth the top and place into the freezer to completely set. When you're ready to serve, gently run a knife around the edge and turn the ice-cream cake onto a serving board (you may need to warm the tin with your hands to release the ice-cream cake). 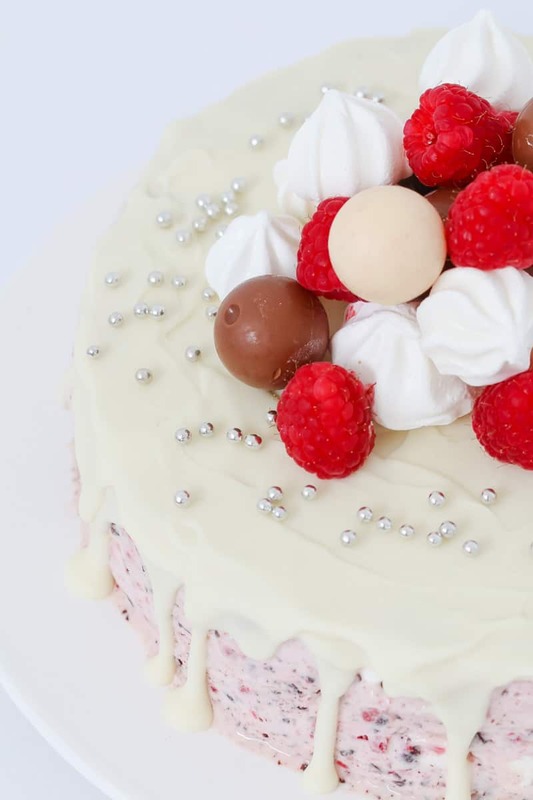 Pour over the bottle of Ice-Magic and decorate with extra meringues, silver edible balls, fresh raspberries and chocolates. Serve immediately (or place back into the freezer until needed). 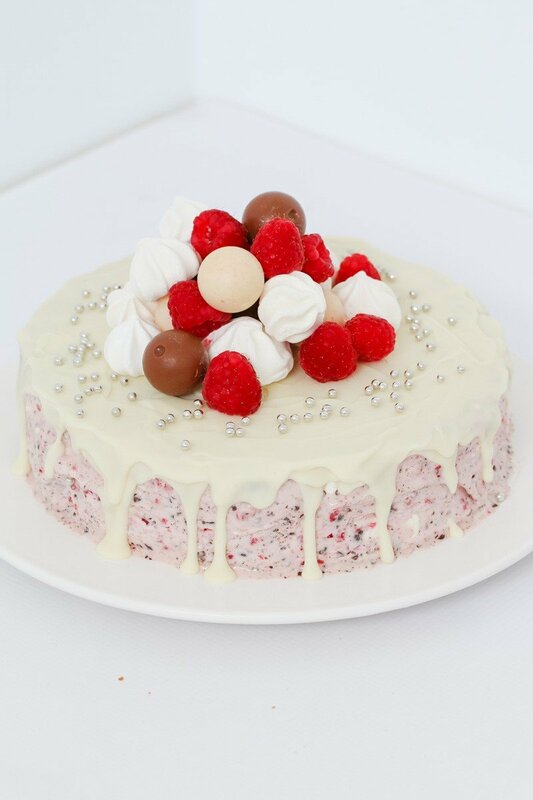 This cake can be stored in an airtight container in the freezer for up to 1 week. 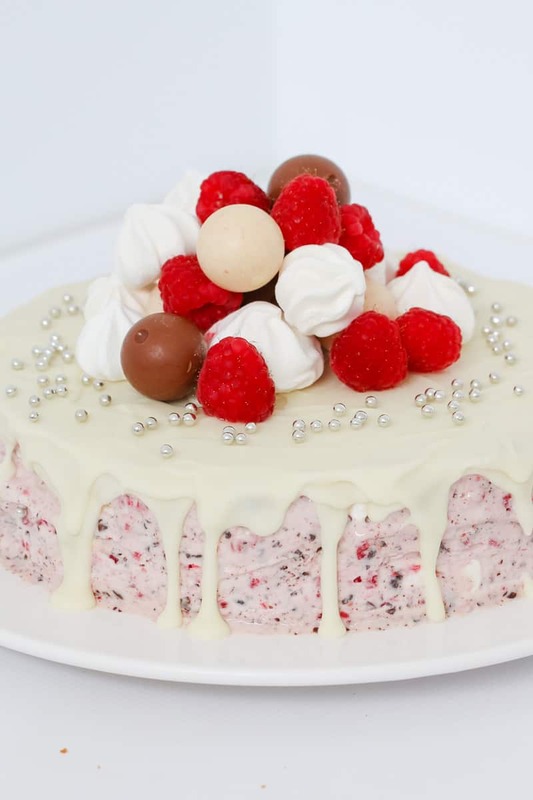 I used Lindt balls when decorating this ice-cream cake. You can find silver edible balls in the baking section of major supermarkets. Place the chocolate into the Thermomix bowl and grate on Speed 8, 10 seconds. Add the frozen raspberries, mini meringues and softened vanilla ice-cream and mix on Reverse, Speed 4 until combined (you'll need to use the spatula to help mix).